I have been going through a re-write of some old rules and bringing some new ideas to them, but even just a couple of months ago, they felt just a little awkward and not sufficiently intuitive. However over the last couple of weeks, I have hit one of those creative moments when things just seem to flow from the pen and fall together in a smoother way. Part of this was generated by bringing in across more elements from my Napoleonic set (Eagles at Quatre Bras) into the design, resulting in a better game. Anyway, I put a game out yesterday that seemed to generate fewer hand written scrawls across my draft set and I had something of a breakthrough in how to handle Divisional Commanders, which I feel is fairly innovative. Please use the 'read more' tab for the rest of this post. My ultimate goal is that these should work out as a core Horse and Musket set with Napoleonic (replacing Eagles at Quatre Bras) and American War of Independence supplements. Anyway, the most recent game was fun, which is a tick and units seem to be staying in the fight for the right amount of time, which is another tick, but the maths on the Capability Test needs a small tweak and disorder does not feel sufficiently integrated between those sub-systems that use it. I will start a replay later today and see how those new ideas and tweaks play out. I anticipate making this (free) set available shortly in a Beta version. 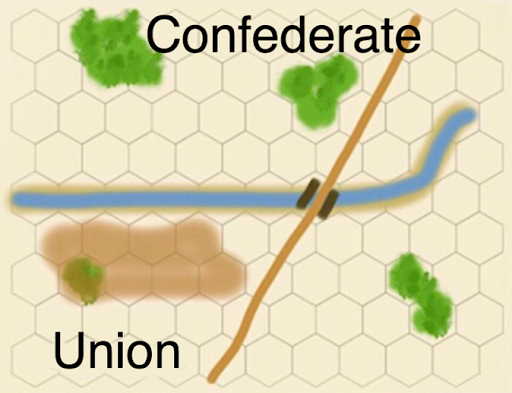 As a fictional scenario, both sides rolled on the Armaments table for each regiment, this resulted in 2 Union and 4 Confederate regiments being armed with smoothbore musket. By chance, both Union units were in 1st brigade, who stood directly below the hill in the wooded area. Rather than engaging from a distance, 1st Brigade now faced the bleak prospect of crossing open terrain and then the stream at the foot of the hill, while all the time exposed to the enemy rifled muskets. Random Event - 'Up and at them boys', The player added a +2 to one of their pre-charge Capability Tests during that turn. A charging unit failed their pre-charge capability test. The charge still went ahead, but had the 'half-hearted charge' penalty. On the right, a regiment could not fight their way out of the stream. They got a 'disordered for 20 minutes' result and so remained in that state until the random Game Clock moved beyond 1133 hours. As units began taking heavy casualties, they became 'less capable' and having fresh reserves close by was essential to exploit the gains made. 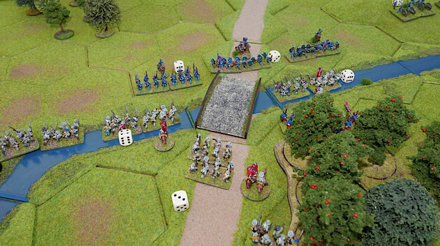 A regiment charged across the bridge, but twice were thrown back. 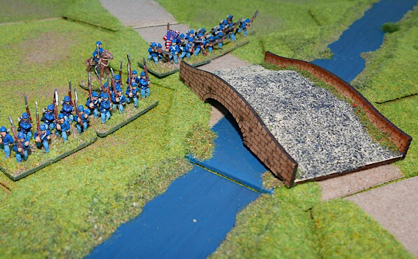 However another regiment had got across the stream on foot and the Union regiment defending the bridge suddenly had the status of 'threatened flank', compelling them to abandon their position in front of the bridge. A Union reinforcing regiment got caught in March Column by a bold Confederate move. The Confederates passed their pre-charge checks, so made a full attack against this very vulnerable formation, inflicting hits on 5's and 6's but receiving hits on 1's. Just a very unlucky roll of dice caused the Confederates more Heavy Casualties than they inflicted and in the post charge Capability Tests, they picked up a 'Stand in place, take an additional Heavy Casualty marker and go disordered for 20 minutes' result. Regiments within a brigade can support each other and so are encouraged to stay in close proximity. To stray too far from their Brigade Commander gives them Out of Command penalties. Keyes' reinforcements had been arriving in drabs and had already started to take positions up left of the bridge, when the right suddenly looked threatened. 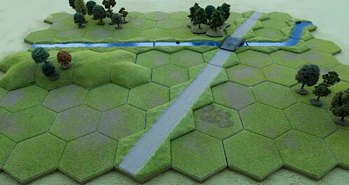 A reinforcement on the road was well placed to move to the right and take up position, but in doing so would put itself at the limits of Command range of the rest of the Brigade. It would find it difficult to work with other regiments and would find it very difficult to start work further out on that flank due to command radius limitations. I was really torn between keeping the brigade together and plugging the gap on the flank. Anyway, tons of fun, which is a prime reason to play for this gamer. Hopefully the rules will be nicely rounded out as they go through a final dusting down. If these interest you please keep an eye on this blog and likewise my Commanders website (link below). Very enjoyable to follow your rules' development process, Norm. I find rules design a gratifying piece of the hobby. Actually our hobby has many, many interesting and gratifying aspects, does it not? You can be sure, I will continue following these developments! Look forward to seeing your approach with these rules and the mechanisms you apply within them. 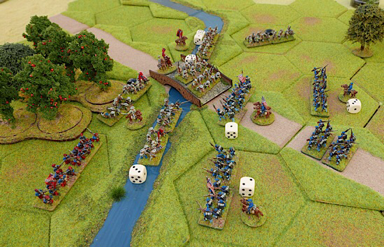 You could still use "Eagles at Quatre Bras" by making it the title for your Napoleonic module. Possible titles for other modules: "Crackers at Gettysburg" (ACW), "Pantalons Rouge at Sedan" (FPW), "Contemptibles at Mons" (1914)--the possibilities are endless! Thanks all, I am pretty pleased with the rules, so hope others will be too. Chris, i will be keeping the eagles at Quatre Bras title, as it is currently Beta and quite a lot of it is in the ACW set. I have started penning notes to expand things further, though it may well just be best to post the design notes that will be included with the rules. Anyway it is nice to be involved in this and also to share. this is great news! I'm looking forward to seeing the latest draft. Nice looking game, beautiful terrain! Version 5 Lock 'n Load Tactical, a first look. Do my rules do that? The 2nd Maryland musters in! Come on! My Brave Fusiliers! Going back to the English Civil War.